ARE BUILT-IN APPLIANCES RIGHT FOR YOU? Built-in appliances, as opposed to freestanding, are both visually, and physically integrated into the cabinetry around them. Some even offer the ability to install custom panels, to match your kitchen materials exactly. They also offer seamless design, by coming flush with your cabinetry. Built-ins are also a great choice for kitchens large and small. 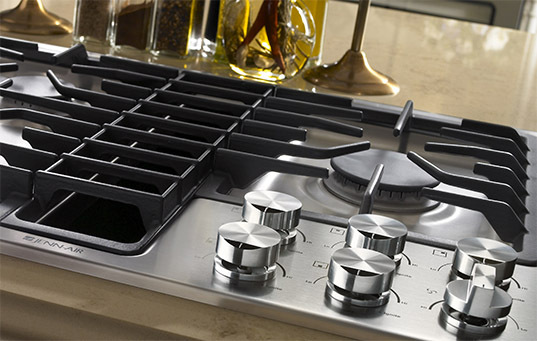 A separate cooktop can free up space, and be located either on the countertop or kitchen island. Plus, with individual ovens and cooktops, you’re free to choose your preferred fuel type for each, for example a gas cooktop with an electric oven. Built-in refrigerators integrate into surrounding cabinets and create a sleek, fitted, custom upscale appearance. 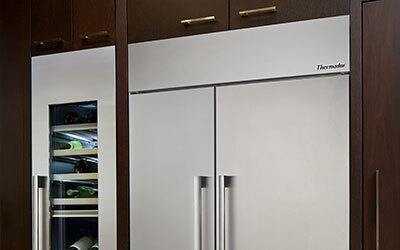 Choose styles from french-door, side-by-side, bottom-freezer and more. Available in many colors such as stainless steel, black or custom panels. Refrigerators range in available height from 43” and up. Widths range from 29” to 40” and up. Able to be installed in a countertop or kitchen island, built-in cooktops are available in gas, electric, induction, and may also offer a downdraft ventilation system. 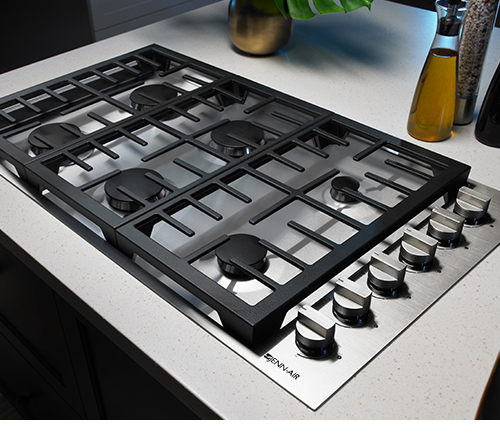 Because they aren’t attached to a range, they offer additional sizes (which can mean additional burners), including 30-, 36-, and 48-inch models. 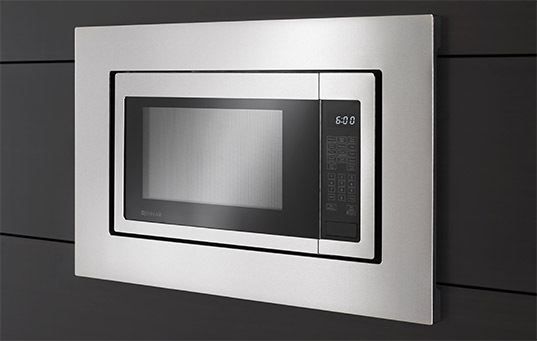 Available as a stand-alone appliance, or as a microwave/wall oven combination, built-in microwaves offer the same features as freestanding microwaves, such as convection. Adding a trim kit to a countertop microwave achieves a sleek, built-in look. 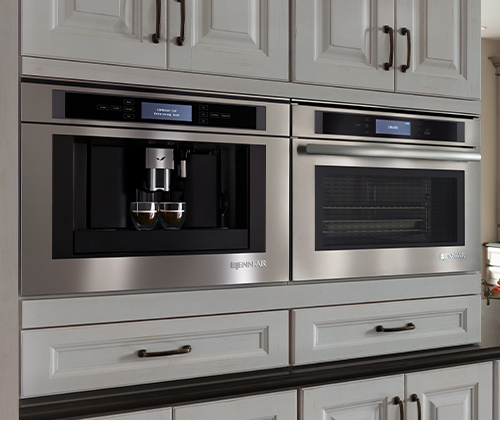 Combination ovens, as well as countertop microwave trim kits, come in 27- and 30-inch sizes. Practical and ergonomic, wall ovens free up space normally occupied by a traditional range oven, and are more accessible when placed at chest height. Choose from single or double configurations (perfect for multitasking). 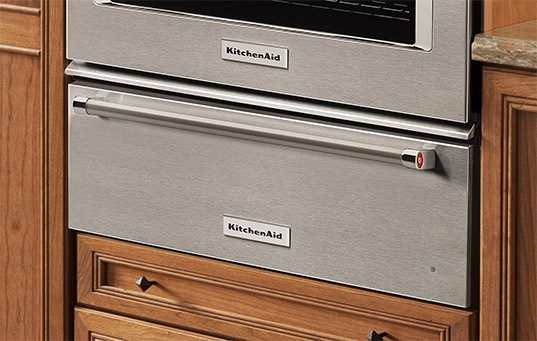 Install double wall ovens stacked on top of one another, or side-by-side. 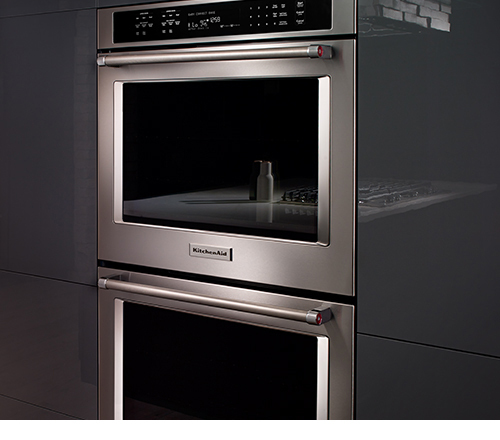 Wall ovens are available in 24-, 27-, and 30-inch sizes. Don’t forget about your ventilation options. 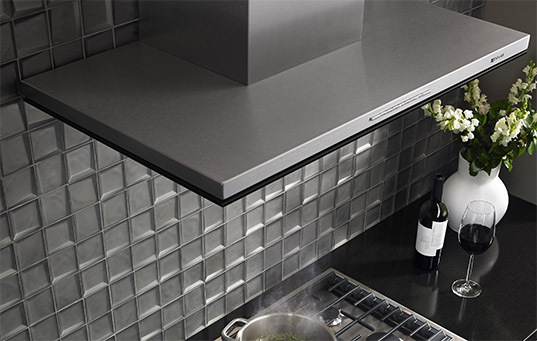 Complement your cooktop and wall ovens with a wall mount, island mount, or under cabinet hood. Built-in warming drawers do more than just keep food warm. Use these convenient drawers for slow-cooking, proofing bread and warming plates. 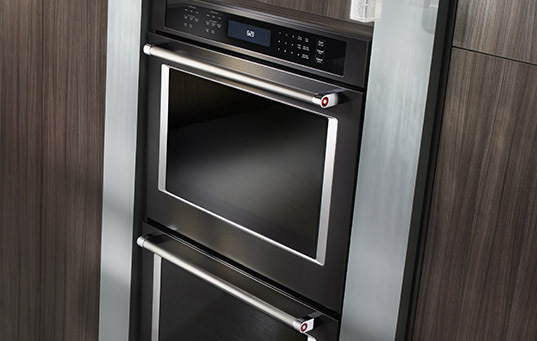 Match your wall oven size with 24-, 27-, and 30-inch options. When shopping for built-ins that best suit your kitchen, there’s a lot to choose from. First, decide on how you’ll design your kitchen, choosing the types of built-ins you’ll want (e.g. single or double wall oven). Then, choose your style, selecting from various features and finishes. Before installing, it’s important to know the precise measurements of the spaces where you plan to install built-ins. With built-ins, depth is especially important, as you’ll want to install the appliances flush with the surrounding cabinetry and countertops. To perfectly integrate your wall oven or countertop microwave, you'll need to purchase a trim kit. While freestanding appliances might be an easy DIY project, built-in appliances have additional requirements for installation, so consider professional assistance.